Whether you are remodeling or building a new home, floor lamination has become a popular choice for active areas within the home, offering exceptional durability. If you love the look of real hardwood but are concerned with the upkeep, then laminate hardwood floors could be your answer. If you are concerned with tearing up your old floor or you don't want to spend the additional money for a real hardwood floor, then a laminate wood floor may be a great alternative for you. Laminate floors are also a great product for do-it-yourself installations. 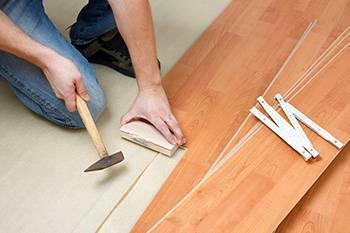 Urban Hardwood Floors offers certified, registered, endorsed laminate flooring installation. We stand behind all our products and the installation with an unconditional guarantee. At Urban Hardwood Floors consumers can find a wide selection of laminate flooring brands in many different designs, sizes and colors. The floors come in many different plank widths and square tile sizes. The stylish designs range from realistic stone, tile and hardwood visuals giving you a perfectly finished and professional laminate wood and laminate hardwood floors. We at Urban Hardwood Floors bring you quality floor lamination services through some of the most popular laminate floor manufacturers. Laminate floors are installed by floating the planks over most substrates including plywood, OSB, concrete slabs and some existing floor coverings. The planks and tiles have tongue and groove edges that lock them together. These floors are never secured directly to the sub floor. Most laminate floors require no glue to secure the planks and tiles together, they just snap together. Glueless laminate floor installation makes these floors quick and easy-to-install and ideal for do-it-yourself installations. Some other laminate floors are pre-glued at the factory and only require a damp sponge to re-activate the adhesive along the tongue edges. A few other laminate floors do require a specially formulated glue to be applied to each of the plank edges.